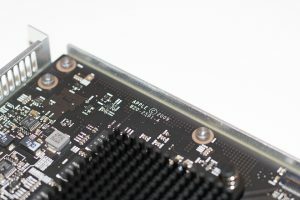 2009 Apple RAID PCI Card, still useful today? I recently got my hands on an Apple RAID PCI card. This time not to take apart and mess around with but simply to test and see how it works as I never had a chance to do so. I’ve worked on systems with the card built-in and in operation but the RAID’s were working so all I could really do was stare at it for a minute and move on. With 512MB cache and a 72 hour cache battery backup occupying just a single slot, this card is not just good looking, it sported some pretty good specs for a RAID card in that day. For testing I used an entry level Early 2009 Mac Pro with single 2.66GHz 4-core CPU and 16GB RAM, running macOS 10.12.5 Sierra. My question; is this card useful in 2017? The card was untested when I asked to borrow it (SellYourMac.com was awesome enough to let me have this card for a bit, even though they know I tend to break things just so I can figure out how to make it work again) so I didn’t know what to expect when I received it. I had never given it any thought but the first thing I asked myself was “where do I connect the drives?”, assuming I’d have to take the existing SATA cable out of the Mac so there would be space for cables to run from the drives to the card. Alas there isn’t a single connection on the card to run cables to anything. Huh? 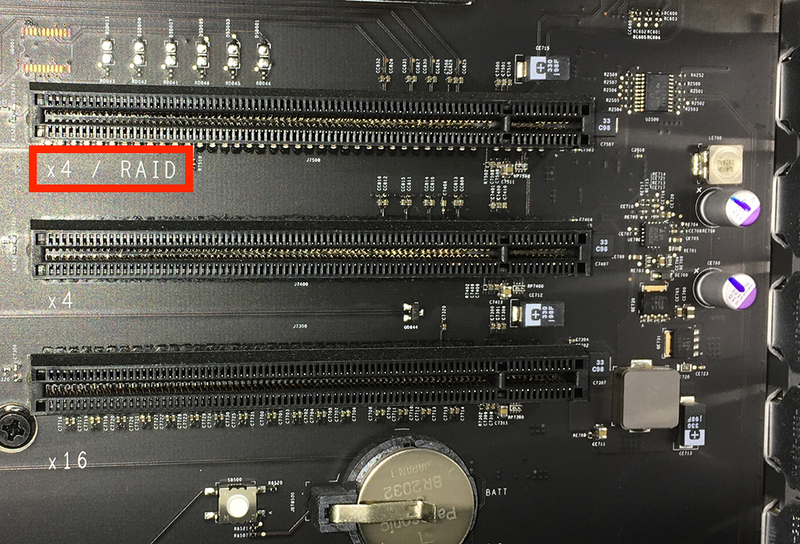 I looked for a special connection on the board that maybe this card would slot into when seated in the PCI slot but did not find that either. What I did notice was the top PCI slot not only had the amount of lanes available printed below it but also “RAID”. I had noticed this in the past and figured it was there to ensure some doofus wouldn’t put the card in another slot further away from the hard drives. Routing all those cables around the other PCI cards would be a mess! Well I was wrong. PCI slot 4 is specifically for the RAID card, it won’t work in any other slot (I tried). Of course, Apple wired all that stuff up in the board itself. Neat solution. With the card in place and 3x1TB drives installed, time to see what this card is all about. 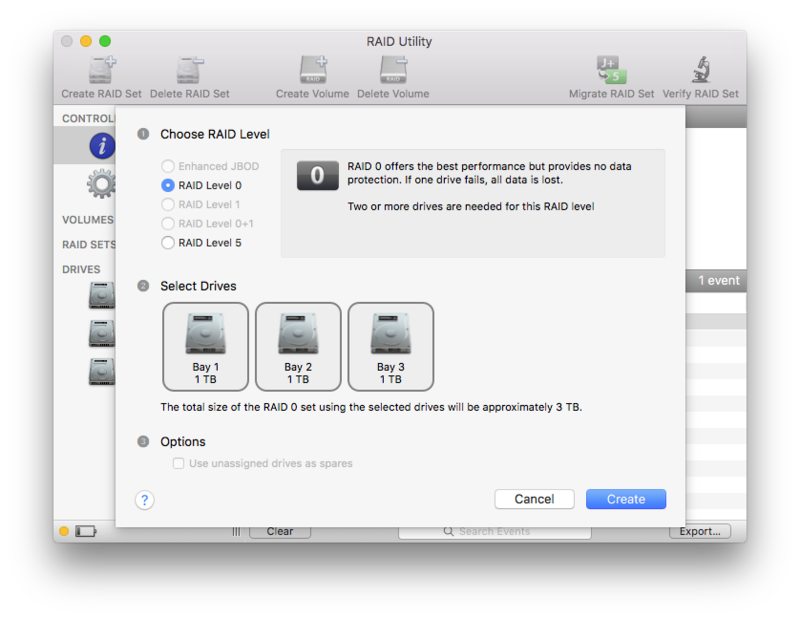 Disk Utility immediately identified the hard drives as belonging to the RAID card but setting up the RAID is done through RAID Utility. In my case I had only two RAID types to choose from and since RAID 5 is not what I’m after (noone should be at this point), RAID 0 remains. Creating a RAID set and subsequently a RAID volume takes a good 30 minutes. No idea why it has to take that long but I hear it’s on the low end so I got lucky. The end result is a 3TB volume with a nifty little icon assigned by macOS. Time for a performance test! Using the free AJA System Test Lite I selected the volume and ran the test, a 1GB file written to the volume and then read back. Ouch, that can’t be right! It’s certainly faster than a single internal hard drive but not worth the $700 this card cost when it was still being sold. A look at RAID Utility quickly showed the cause, the battery on the card was still being calibrated. Depending on how long this card had been on the shelf, this could take up to 12 hours. Without the battery there is no write cache but luckily the cache can be forced on with the click of a button. The risk being that a power interruption will corrupt data that’s being written to the RAID. With the write cache enabled I ran the test again. That’s more like it! 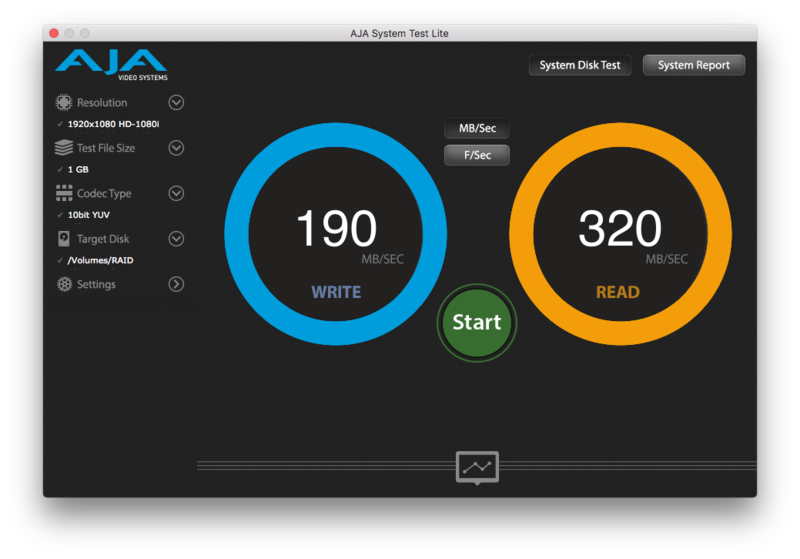 Under ideal conditions an internal HDD (standard 7200rpm) on a Mac Pro will give you 120MB/sec write and 150MB/sec read speeds on average, usually much lower depending on fragmentation, how full the drive is and if the system itself runs off that drive as well. Merging three of these drives together gave me almost triple the ideal speeds. But why would this expensive card be a justified purchase if I can just create a RAID 0 with Disk Utility or SoftRAID? 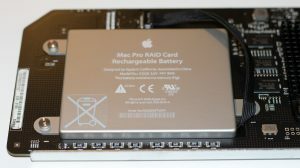 The battery is nice but anyone that values their data, on a RAID or otherwise, will have their Mac connected to a battery backup anyway. 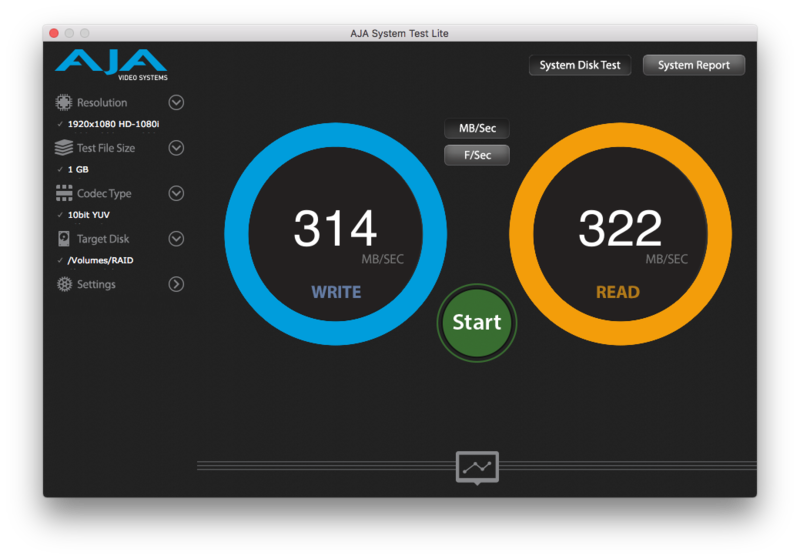 Apparently the hardware card takes some pressure off of the CPU during read/write operations to the RAID. This might be a big deal when Terabytes of data are flowing in and out of the volume all day every day but whatever test I threw at it showed no additional pressure on the CPU. I guess this card provides a higher and more consistent speed then? To test this, the RAID set was destroyed and the card was removed but not before receiving a warning from RAID Utility (3 hours after installing it) that unfortunately the battery had failed. With the battery confirmed dead, the write cache disabled itself. This tanked the write speeds back to 185-195MB/sec. and RAID Utility no longer offered the button to force the cache back on. After a restart the button reappeared but the restart after that it was gone again, very inconsistent. With the card removed I created a RAID 0 again in Disk Utility. Not only was this done in under a minute, the speeds were actually better than those I got with the RAID card installed. After several tests the average speed bump was 13-18MB/sec for both read and write operations. And not only was this setup faster, there was no difference in CPU load even with very large data transfers. The speeds were consistent on OS X 10.11 El Capitan as well which I tested because a 2009 Mac Pro is not officially supported to run Sierra. Things may have been different back in 2009 when this card was released. Maybe a driver that was part of the OS back then that’s since been removed or something. The OS out at the time this card was for sale was Mac OS X 10.6 Snow Leopard. So the RAID was destroyed, Mac was wiped and 10.6 was installed (and holy crap does it run fast!). After running all the updates I repeated the tests and found the same speed with the card (the one time I was able to activate the write cache) and the same speeds with the RAID set up in Disk Utility. As AJA is not available for 10.6 I had to find a utility that did work and ended up with DigiloydTools. The test used a 2GB file and ran 5 iterations with write speeds of 310-320MB/sec and read speeds of 319-322MB/sec. On par with Disk Utility’s RAID setup in the other OS versions. With RAID 5 being a bad idea even back in 2009 and RAID 0+1 being hella expensive, these two RAID levels alone could not have been part of the sales pitch. Unfortunately after some research I can not see what the benefit of this card was over Disk Utility. 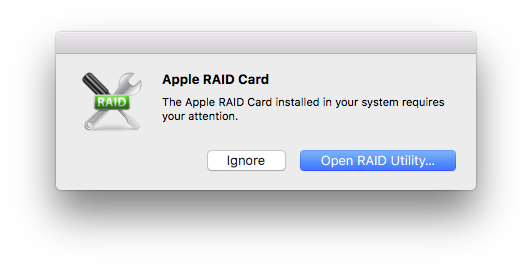 Perhaps it was the two RAID levels that the card offered after all or maybe it was the monitoring and reporting RAID Utility provided which is something Disk Utility doesn’t do. The RAID will start failing and you won’t see it until you open Disk Utility yourself. 1. You probably won’t find one with a battery that’s working. If you do, it won’t hold the full charge and/or will die shortly after you buy the card. A replacement battery runs anywhere from $70 to $110 and of course the replacement will be a used battery as well. Without a functional battery there’s no guarantee the write cache will work. 2. The card runs HOT. 70C (158F) and that’s just with little to no activity. This in turn heats up the hard drives that are directly on top of the card. A drive in bay 3 will feel this, a drive in bay 4 will certainly feel this. 3. The card takes up a valuable PCIe slot. To keep these Mac Pro’s useful, we mostly have to rely on PCI cards. A card for USB 3, a card for an SSD and of course the first slot was already in use by the graphics card. This leaves most Mac Pro users with 1 slot available and plenty of nice cards to put in there to enhance the performance and functionality. The RAID card provides neither. 4. Other options available. If RAID 5 or RAID 0+1 was a must have, this card would have been a good purchase. These days though, and shortly after the RAID card was released, the feature rich SoftRAID offered all the same RAID levels plus tons of additional features. Accelerated rebuilds, email notifications, SSD support, advanced warning and more. Since then more RAID levels were added to the feature set so it’s now many times better and more useful than Disk Utility and the RAID card. Of course external RAID systems are more versatile than using the internal bays on a Mac Pro as well and with a USB 3 or eSATA PCI card the speeds will be more than adequate.